We get a lot of inquiries from supporters about helping sustain the orphanage by sponsoring the children. As we are preparing for visits from so many volunteers and friends this summer we thought revisiting this topic might be helpful. 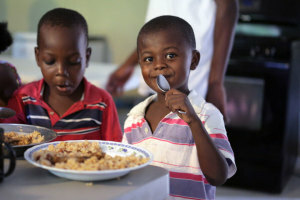 The Fond Blanc Foundation has initiated a child sponsorship program to help support the children at the orphanage. It is a primary way we raise support to care for the children. But we are not primarily a child sponsorship organization, and so our situation may need a bit of explanation. Where other organizations may cover many more children, in more locations and over many geographical areas; our focus is on this one particular orphanage and the needs of these specific 54 children. We also want to be completely clear and wholly transparent about our sponsorship program, and how we use the funds that sponsors provide. Because our process may be different than those of other organizations, we are anxious to avoid any confusion. If you want to sponsor a child but have any questions about our process, please contact us directly. We think the sponsorship process can do two important things well: provide financial support for the children, and help them to have personal relationships with people who care about them. Meeting the needs of the children through sponsorships presents a few challenges. We cannot provide the daily essentials to one child who is sponsored, while ignoring those same needs for another child who may not yet be sponsored. If a sponsor wants to do something special for a particular child we can help with that, but when it comes to using sponsorship funds for general care, please think of us as a bit like the Musketeers: All for one and one for all. In our sponsorship figures, we have aggregated all the costs associated with the orphanage (food & clothing, hygiene, education, health & general care). That means that our requests for sponsorship support are both higher and more all-encompassing than most traditional child sponsorship programs. We suggest that a donor simply pledge the amount they want to give. A donor does not have to fund the child’s entire expenses in order to be a sponsor. Sponsors should also know that 100% of sponsorship contributions go exclusively to meet the actual expenses that directly benefit the children’s lives. We also allow for multiple sponsors per child, which can mean that one child may have many sponsors while another may have few. Fond Blanc is blessed to have hundreds of missionary volunteers visiting the orphanage every year. We are delighted when people develop special connections with specific children during those visits. These relationships have come to mean a great deal to the children too. We don’t want to limit anyone from continuing in those relationships just because someone else has already chosen to sponsor that specific child. On the other hand, some children naturally attract more attention than others, so we also encourage supporters to think about using sponsorship as a chance to get to know a child who is new to them. Anyone who is interested in sponsoring a child -and especially those who have not yet visited Fond Blanc in person – can still get to know the children individually. Each of them has a space on our website with a picture and a brief bio. We will be adding updates to these children’s folders as well. The financial support is critically necessary, of course, but we also want to do everything we can to help sponsors build an individual connection with any child they want to help. When you sponsor a child, there are opportunities to get postcards, letters, pictures and videos from that child, and if you want to write to the child, we will help you communicate with them directly. Guidance for sponsoring a child in the Fond Blanc Orphanage is calibrated around several different giving levels. Please visit our website for more details on this. We are still new at this, so let us know if you see a way we can do something better. And make plans to come see us in Fond Blanc. That is where the sponsorship relationship really takes root and grows.